The Russian Foreign Ministry says Kiev is reluctant to hand over copies of what it claims to be documents, proving Russian military presence in Ukraine. 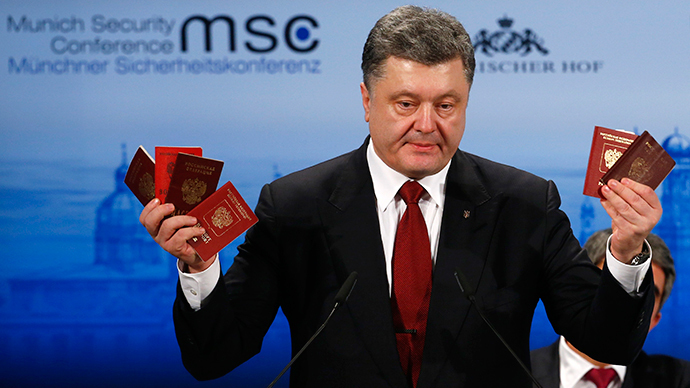 Ukrainian President Petro Poroshenko showed the audience at the Munich Security Conference several passports on Saturday, saying they belonged to Russian soldiers fighting in Ukraine. “We asked the Ukrainian side to give us copies of the documents containing last names, because such IDs, as were shown yesterday, could easily be bought,” said Viktor Sorokin, director of the CIS (Commonwealth of Independent States) department within the Russian Foreign Ministry, as cited by RIA Novosti. The Ukrainian crisis and the prospect of arming Ukrainian troops was again top of the agenda in Munich on Sunday, the last day of the conference. Germany has stayed firm in its opposition to military escalation. German Foreign Minister Frank-Walter Steinmeier said weapons supplies to Ukraine would only aggravate the crisis. He added European security could only be built in cooperation with Russia, not against it. Steinmeier, however, criticized his Russian counterpart Foreign Minister Sergey Lavrov for his remarks, in which he accused the US and the EU of escalating the crisis in Ukraine. "It is Moscow's responsibility to identify common interests," Steinmeier said. "We have seen too little of this so far. And the speech by my colleague Lavrov yesterday made no contribution to this." US Secretary of State John Kerry denied America and Europe were split over the Ukraine crisis. "On the fundamental goal with respect to Ukraine, we are absolutely united ... we want a diplomatic solution," he said. Nevertheless, on Thursday, Kerry spoke to Ukraine’s leadership in Kiev about the possibility of supplying arms at the same time the German and French leaders announced snap talks with Putin and Poroshenko to discuss a new peace plan. “President Hollande, Chancellor Merkel seem to have a much greater sense of responsibility about the importance of getting a quick ceasefire and new negotiating framework or restore the negotiating framework of the Minsk process. One doesn’t sense the same urgency in Washington,” Martin Sieff, columnist for the Post-Examiner newspaper, told RT. US Senator John McCain voiced the idea of arming Ukrainian troops on Sunday. "In the heart of Europe, we see Russia emboldened by a significant modernization of its military, resurrecting old imperial ambitions and intent on conquest once again," McCain said in Munich. He has called for sending "defensive weapons" to Ukraine. The term has raised questions, though. Russian Foreign Minister Sergey Lavrov also noted the idea of supplying weapons to Kiev remains quite unpopular in Europe. “The majority, if not all European politicians, consider the idea [of weapons supplies to Ukraine] a bad one, an idea that might lead to further aggravating the Ukrainian crisis,” he said on Sunday. French Foreign Minister Laurent Fabius reiterated that granting a special legal status to breakaway territories in eastern Ukraine could be a solution to the crisis. In September, President Poroshenko said there would be no special status for the Donetsk and the Lugansk regions. There have been reports that the new text of the peace deal on Ukraine, presented by Merkel and Hollande, contains the promise of more autonomy for rebel-held eastern Ukraine. The latest escalation of violence started in mid-January after Kiev announced a mass operation against Donetsk airport, in violation of a previous ceasefire agreement. Since then there have been almost daily reports of civilian casualties in the conflict. Five people died in shelling on a hospital in Donetsk on Wednesday. The UN has warned of a looming humanitarian catastrophe in the region.